Hemmelig Tempo: Do We Really Need Musicians? Do We Really Need Musicians? Equipment and materials: Wooden boards, trolley, Mr. Robot, light robot, Looping Louie, fan, accessories, black paint, Roland Sp-404, Korg Microkorg, 2 x Digitalent Hand Midi Controllers, 4 piezo microphones, Vermona Drm mk 2, Roland Space Echo Re-3, Alesis Dm4, DrumQuadrix. Participants: Professor Fokuda-san, Professor Waffel, Doctor Døv and Guest Professor Suuperknüller. Hemmelig Tempo was commissioned by Jørgen Larsson at Lydgalleriet to provide a sound installation for this years Ekko Festival in Bergen. Previous DIY sequencers that had been used for live research purposes became the starting point for the installation. 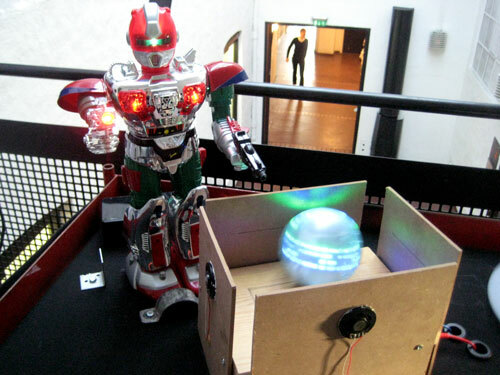 A robot was purchased by Professor Waffel for 10 kroner at a local flee-market. Doctor Døv’s old light show robot ball found it’s proper place and purpose in life. Guest Professor Superknuller helped out with the final assembly of the work, replacing Professor Fokuda-san who had timely prioritized surfing duties in the Netherlands. However, there will be secret repercussions. Note also that Mister Pixel was assigned to document the project on video, but sadly lost his way altogether. 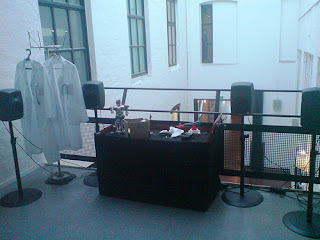 The three units represent Hemmelig Tempo and will presently perform as stand-ins around the world: The robot revolves around his waist to trigger a photosensor connected to a Roland SP-404 sampler. 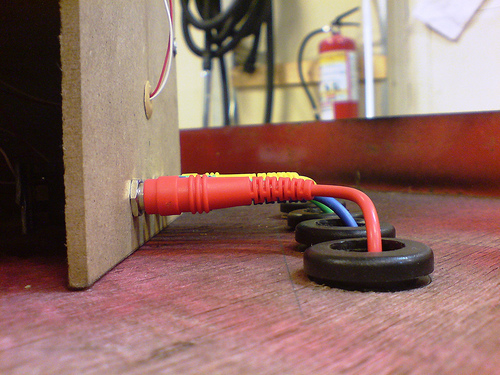 Professor Fokuda-san and Doctor Døv assembled a small wooden box with 4 piezo microphones. These were connected to an Alessis Dm4 that transforms analogue signals to midi signals. These were sent to a Vermona Drm mk2. The DrumQuadrix, as it was called, needed to be additionally triggered by the robot since it had the habit of stopping every ten minutes or so, waiting for an audiosignal to set it to work again. 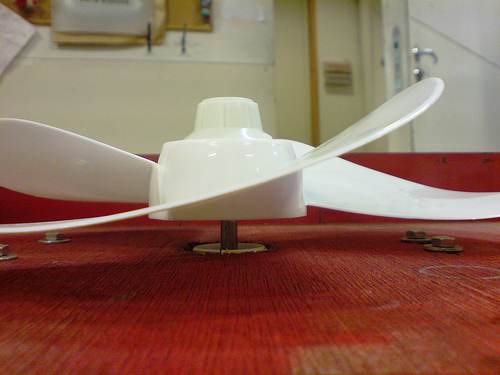 Finally, Looping Louie revolves over the fan which temporarily sends it flying into the air, descending upon the photosensor which triggers the synthesizer. The lights emanating from these units made the installation particularly visible during the night.The items, representing a bass-player, a drummer, and a keyboardist, were assembled on a wooden board on a small trolley, making the installation mobile. During the installation at Ekko festivalen, the robot behaved like a spoilt child, needing battery replacement every two hours. However, on the second day he had suddenly disengaged his own feet, and was able to use much less energy, although you could tell that the effort had been a strain. Looping Louie on the other hand was reported to be something of a perpetuum mobile, continuing into the long hours of the night and flying high in the morning. What was he on?